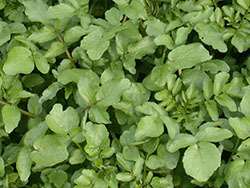 Pungent tender shoots or leaves are eaten in soup, salad, or as a garnish and condiment. Beta-carotene: medium; vitamin E: low; riboflavin: low; folic acid: high; ascorbic acid: extremely high; calcium: medium; iron: medium; protein: 2.1%. Leaves also contain phenethyl isothiocyanate (glucosinolate).